Davido has taken another swipe at Dele Momodu but this time it was caused by a fan. 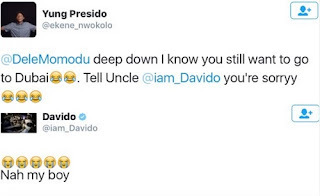 The fan tweeted at Dele Momodu saying he knows deep down that he still wants to go to Dubai and asked that he apologise to Davido. Davido then waded in and said 'Nah my boy'.